Members of the LGBTQ community often face discrimination from many directions on a daily basis. From your basic human rights to the legalities of who you love, every aspect of your life seems to be under scrutiny by the outside world. When it comes to adopting a child as an adult that identifies as LGBTQ, you will likely face a wide range of reactions. Domestic infant adoption by LGBT couples is often plagued with myths and inaccuracies surrounding people’s lifestyle choices and their ability to raise a child. As a quality alternative to any adoption agency in California, A is 4 Adoption is here to act as your guide through every step of the process. Private adoption is much more complex than many people realize, and few centers work as hard as ours to deliver the best possible outcome for everyone involved. No matter how prepared you are to add a wonderful new member to your family, you may be faced with discrimination based on a number of common myths. Today, we’ll continue to dispel these myths with the goal of enlightening more people on the joys and benefits of LGBT adoption. When you are done reading, be sure to contact our agents to learn more about the adoption process! Myth Four: Children raised by gay parents are more likely to become gay. Fact: This subject has been at the center of debate for a long time now, and all studies on the subject have posited that the parents’ sexual orientation has zero impact on their children’s sexual preferences. Furthermore, children of gay or lesbian parents are no more likely to follow the same path compared to children from straight, married, biological parents. To the opposite effect, adopted children of LGBTQ households tend to be much more open to diversity and are normally more tolerant of other world views. Some children in homosexual households will grow up to be homosexual themselves, just as kids of straight homes would. In these scenarios, though, having parents with similar preferences can prove to be a major benefit. Myth Five: Children in LGBT households are more likely to be molested. Fact: The real fact here is that this myth is terribly harmful for loving couples who want to raise a child in need as their own. This myth has been very damaging for LGBTQ members, as the lack of information and exposure to normal society creates distrust of others who are different from you. Researchers have focused on this myth, collecting data to illuminate how safe gay or lesbian households are for adopted children. The conclusion for most professionals is that pedophilia is a sexual attraction that is completely different from your preference for gender. A study by Jenny Carole and her associates looked at 269 cases of child sexual abuse, where only two of the offenders were identified as gay or lesbian. Out of every 100 people interviewed in this study, 0.007 percent of the people identified as homosexual. The conclusion was that children are 100 times more likely to face sexual assault from a relative’s heterosexual partner. While nobody likes to consider the reality of these heinous crimes, it’s important to remember that your gender and sexual orientation do not play a noticeable role. Myth Six: Children in gay or lesbian households will be raised in an immoral environment. Fact: It is impossible to determine what is truly immoral. Every family holds their own beliefs, with some people declaring that cursing is wrong while others may focus on drinking and not going to church. From a subjective standpoint, immorality should be viewed as a negative consequence of being raised in an unhealthy household. There are thousands of children in need of loving homes in our country, and in our mind, denying a child a caring family because those adults appear immoral is actually much more immoral. A is 4 Adoption believes that it is immoral to disclude adoptive parents with possible “immoralities,” leaving the child alone and unsupported. It doesn’t matter who you are or who you love, what matters is how you improve the world with the time and resources that you have. 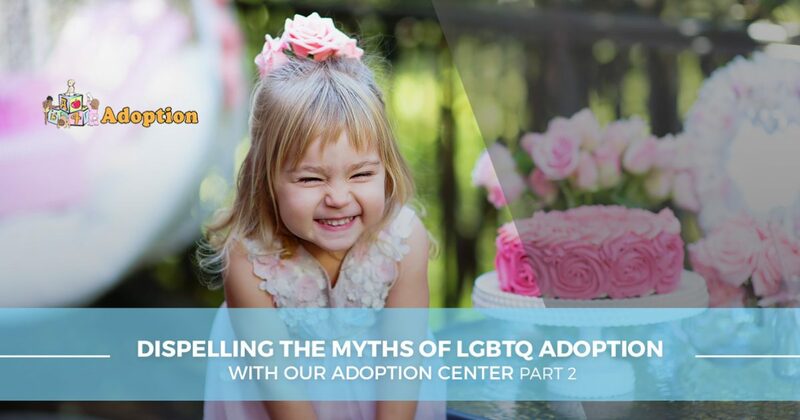 There are a lot of harmful myths surrounding LGBTQ adoption that can create unfavorable outcomes for adoptive parents, the child, and everyone else involved. A is 4 Adoption is proud to support the LGBT community, finding loving parents and pairing them with babies in need to enrich everyone’s lives. Unlike any adoption agency in California, our center works to deliver the best outcome for your family. From adoptive parent support to comprehensive birth mother help, we’re dedicated to providing the best level of support to create a positive environment for everyone involved. Adoption can be tough, but you do not need to face the task alone. We strive to cut through the complexities of the adoption process. Contact us today to learn more or to begin your domestic adoption journey!